My Ivory Silk Lilac tree is about five years old and has appeared to be healthy and flowering until just lately. After blooming this past Spring, we noticed some leaves on a branch turning brown, drying up and falling off. Then all of the leaves on that branch died and so has several other branches of leaves. There doesn't appear to be any bumps or blight visible. Could it be root strangulation as a friend told us the tree was planted too deep? 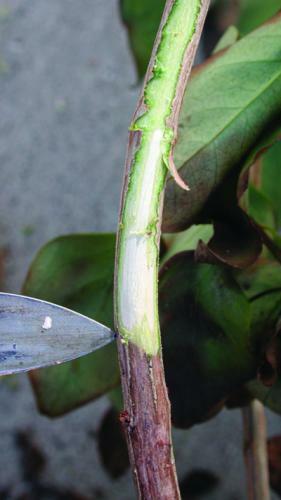 note the junction of diseased and healthy wood where the stem has been girdled. Branches that have been invaded and girdled by the fungus wilt and die back. The diseased wood at the base of the branch near the soil line turns brown. If so, it is probably phytophtora, a root rot fungal disease. are you in an area like me where you have had a very wet summer? 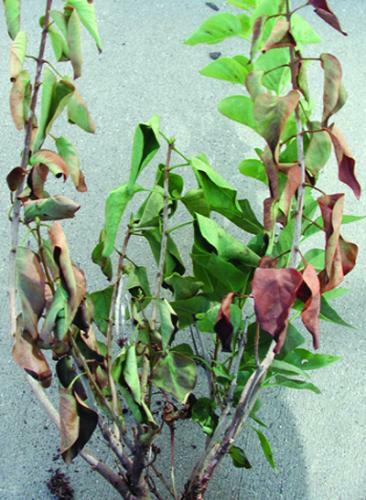 Lilacs are pretty vulnerable to root rot in those conditions. You can try using a fungicide as a root drench. You might try pulling some soil away from the base of the trunk where it is buried too deep. But don't let it stay around the tree where it would hold water. Create some slope away from the tree to keep water from pooling. You can try amending your soil with bark chips to improve drainage. When the leaves fall, be sure to rake them up and destroy (not compost). Best wishes and welcome to the Forum!